The midterms are finally over. But at the Diversity Dashboard, we won’t be resting just yet! Now, of course, is the time where we take the results and try to paint a clear picture of who these thousands of newly elected government officials are and which communities they will be representing. As many of you know, the 2018 midterms marked the highest level of candidate diversity in history. US Congressional projected winners have a made both chambers more diverse than ever before. We have been hard at work watching local, state, and US Congressional races around the county, while following a number of close races yet to be decided that feature minority candidates hoping to unseat their white male challengers. Going into election day, only 58% of US Congressional contenders were white males, the lowest percentage to date (The Cook Political Report). As of this writing, 99 women have won US House seats, pushing the number to 121 women to serve next year; thirteen women have picked up Senate seats filling the chamber with 24 women come January. 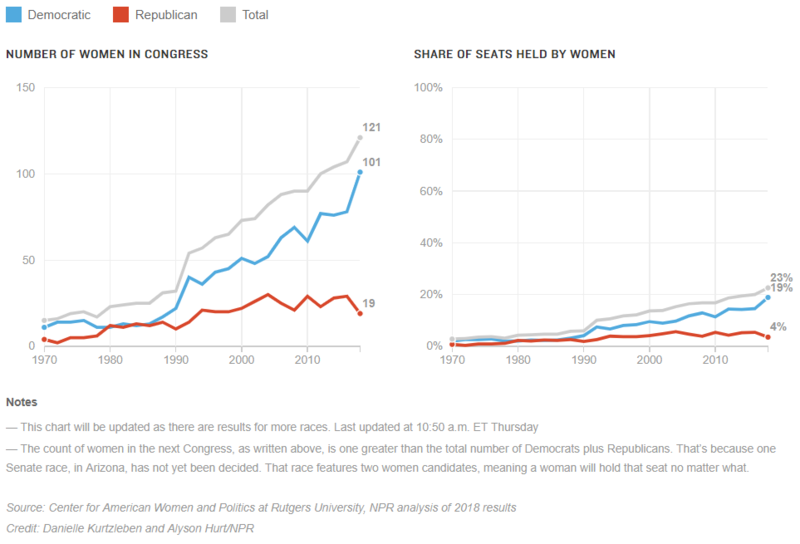 The graphs below show the historic context of momentum building that began with the original “pink wave” seen in the 1992 election year with record breaking numbers of women elected into Congress and Anita Hill being on everyone’s minds. Historically, it is quite remarkable that the increase has continued very favorably for Democratic congresswomen and remained steadily low by their Republican counterparts. Together, these women make up still less than 25% of Congress. But the increase term by term doesn’t seem to be slowing down, especially for the Democrats. In the chart above, we see that this week’s election is a continuation of marked increases over past election cycles. 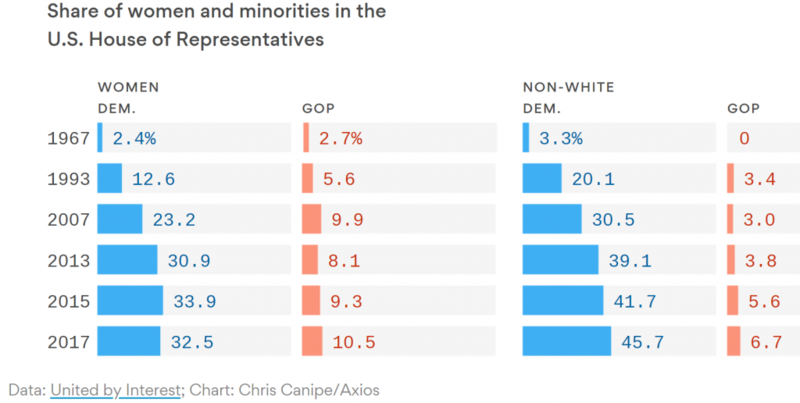 The progress of non-white Democrats in Congress shows a stark difference at a 45% makeup to GOP’s 6.7%. As all the remaining races are decided, it will be interesting to see how the minority percentages increase in both parties. The election of more women in the chambers is not the only wave of diversity flooding the country; both congressional races and gubernatorial races saw history made in number of minority leadership “firsts”. In January, CAWP reported the highest number of women of color serving in the US House in January was 34 in 2017; come the new year, there will be a record total of at least 40 women of color in the House. Of the women of color already selected, 21 are Black women, ten are Latina, six are Asian/Pacific Islander, two are Native American , and one is a Middle Eastern/North African. All 40 are Democrats. Currently Young Kim (R), who immigrated from South Korea, is in a tight race with Hispanic contender Gil Cisneros for California’s 39th Congressional District. With many more diverse candidates on ballots in lesser known races, it does seem to be an election teeming with opportunities to prioritize diversity in our political leaders. Of the whole lot, here are some highlighted races that were big wins for diversity! In Michigan, Rashida Tlaib became the first Muslim woman elected to the US House. She was joined by another Muslim woman, Ilhan Omar, who won Minnesota’s Fifth Congressional District. Both are Democrats. Democrat Sharice Davids was the first Native American woman elected to Congress, winning Kansas’s Third Congressional District by nine points. She is also the state’s first openly gay representative. She beat incumbent Republican Kevin Yoder. Another Native American win came from Deb Haaland, a member of New Mexico’s Laguna Pueblo people and will serve as representative of NM 1st congressional district. Hispanic women came out strong as well. Newly-elected Lieutenant Governor of Florida, Jeanette Nuñez will be the first Hispanic women to hold the position of Lieutenant Governor in Florida. Veronica Escobar and Sylvia Garcia became the first Latina congresswomen from Texas. Age played a huge factor in these elections, with noteworthy wins by two 29-year-old women, Abby Finkenauer, a Democrat from Iowa, and Alexandria Ocasio-Cortez, a Hispanic Democratic Socialist from New York, making them the youngest congress members in history. Finkenauer also distinguishes her win as the first female congress woman from Iowa. In the 36 governor’s races occurring this midterm, more notable wins for #diversity came from eight women elected, four of which were incumbents (2R, 2D). This means at least 9 (6D, 3R) women will serve as governors in 2019, including the first woman of color, Latina governor Michele Lujan Grisham (D) of New Mexico. Stacey Abrams (D), who would be the first Black woman governor, is still contesting her race in Georgia. Kansas’ Laura Kelly (D) defeated incumbent Jeff Colyer (R) for a big blue win for Kansas. Both Michigan (Gretchen Whitmer) and Rhode Island (Gina Raimondo) voted in Democrat women instead of their Republican male challengers. Janet Mills defeated Republican incumbent Paul LePage to become the first female governor of Maine. LGBT candidate Jared Polis won the Colorado gubernatorial race, becoming the nation’s first openly-gay governor. Wins for diversity are paramount for continuing to narrow gaps in minority representation on state and federal levels. Yet, it is our duty as citizens of our communities to focus attention on local government and decide who we want representing our interests closest to home. At ELGL, we are always trying to find barrier-free ways to help constituents be more informed and more involved. 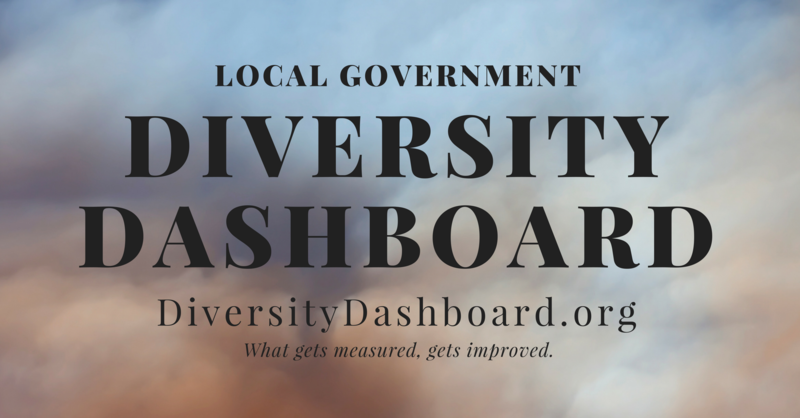 Diversity Dashboard collects important demography data on local government leaders to provide resources and support to enable you, myself, and every other voter in this country to become active participants. By encouraging political literacy we increase transparency and constituent empowerment in every municipality in this country. With mayoral elections also conducted across the country Tuesday, we are putting the data together to find if the “pink wave” contributed also to local election results. According to the United States Conference of Mayors, an official non-partisan organization of cities with a population of 30,000 or larger, over 200 mayoral races were on the ballot this year. As of this writing, fifty-five women have been confirmed winners heading to the mayor’s office next year. 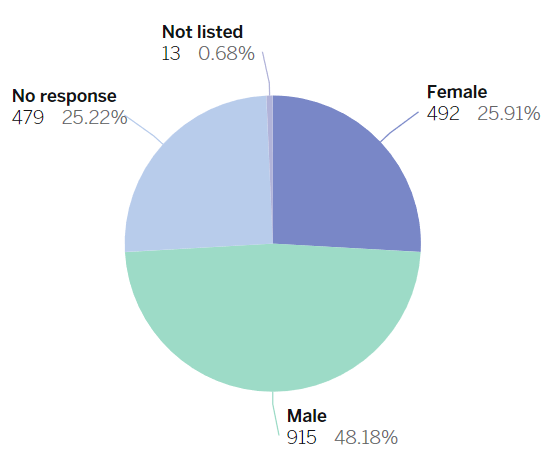 The Diversity Dashboard survey results show that women are only about 26% of the survey respondents. As more mayoral results are analysed, these newly elected mayors may change the level of diversity in our dashboard. California saw the largest number of mayoral elections this midterm, with 70 mayoral races in cities with over 30K population. Out of those races, 14 winners were women, with ten of those women as incumbents. Four women ousted their male incumbent challengers, while two women incumbents lost their races to men. 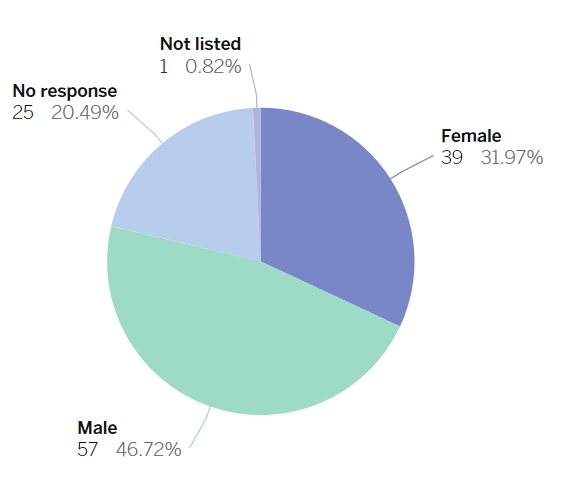 According to the Diversity Dashboard, this falls in line with our California survey respondents who, though limited in response rates, are reporting the highest percentage of female CAOs in the country. Florida saw quite a few mayoral elections this week. Out of 19 high-population municipalities, 8 were won by women, with five of those wins beating male incumbent challengers. DD survey respondents in Florida also had a higher rate of women in local leadership in comparison to the country average. 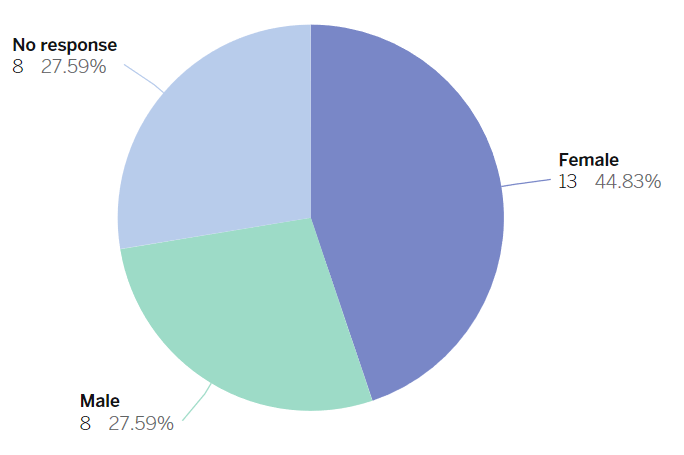 As we continue to analyse local election results and compare them with our increasing survey responses, it will be exciting to see how far our diverse waves have reached in this election cycle. Thank you for voting and being part of a beautiful community prioritizing civil engagement and participation! Thanks for tuning in to Data Stories! Catch y’all next time for more data exploration!